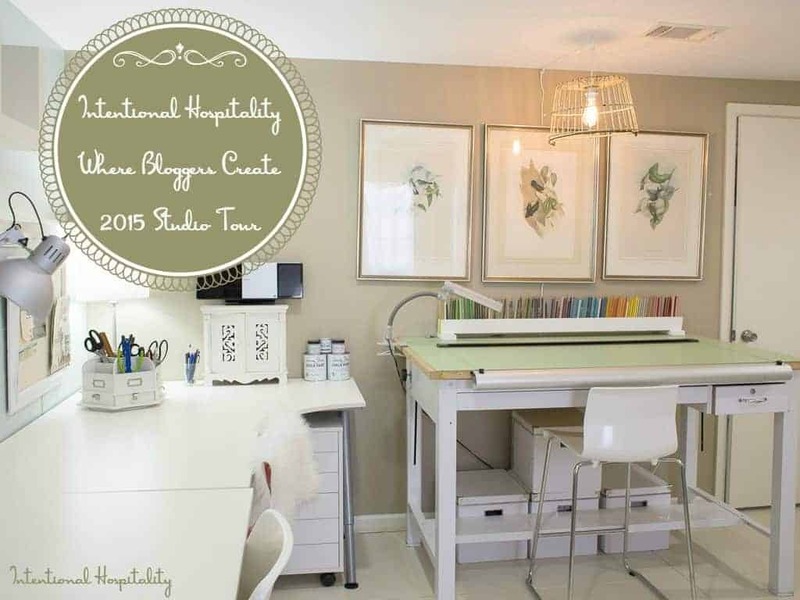 I’m so pleased to be participating in the Where Bloggers Create 2015 studio tour hosted by Karen over at My Desert Cottage. 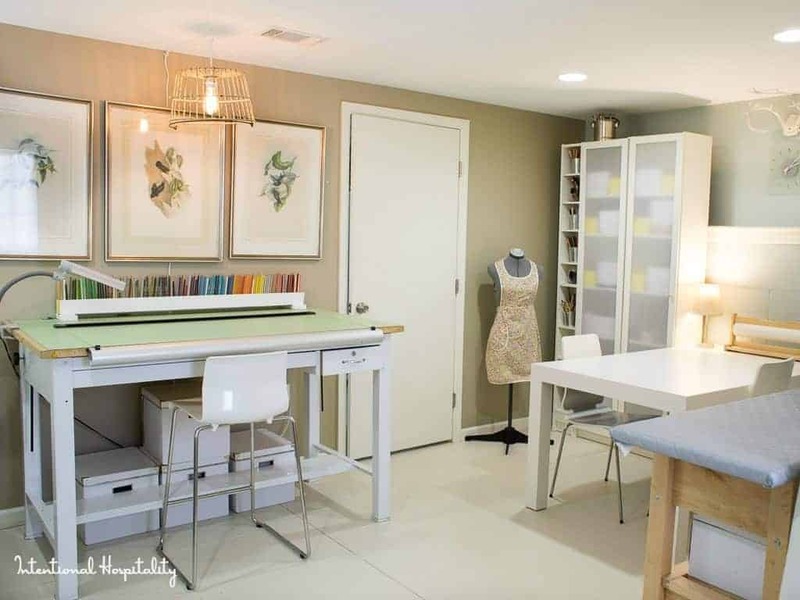 My studio is my happy place, a place to be creative whether it’s working in colored pencils, watercolors, sewing, crafts or photography there is space to do it all. There is also storage to keep all my supplies neatly in order. This little corner is where I enjoy setting with my computer, quietly working on a blog post or browsing through Pinterest getting ideas to do in my studio. I have made the bulletin board for this area to pin all my I want to do some day pictures. 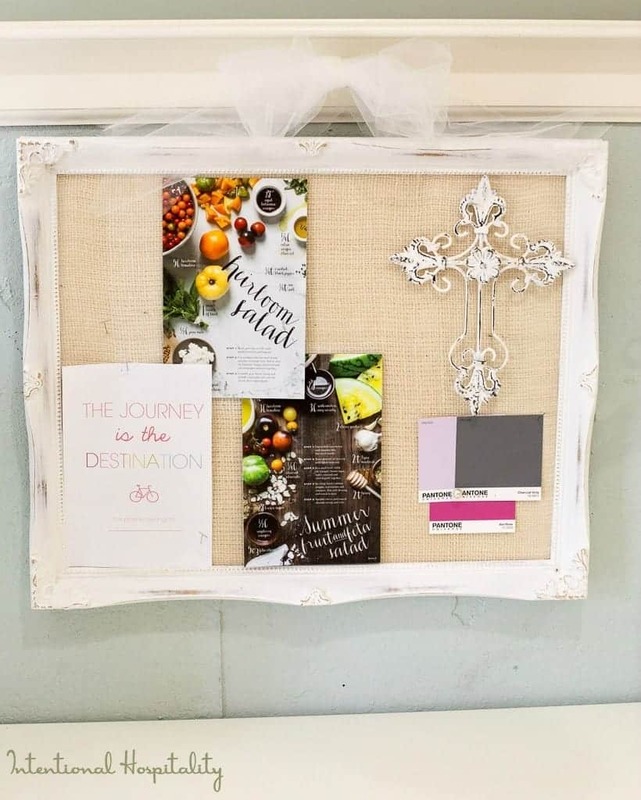 If you would like to see how you can make your own bulletin board be sure and check out my page DYI Bulletin Boards Made From Old Picture Frames. I also have my music station area here. The small white cabinet stores all my music cds. My drafting table is where I mostly enjoy drawing, colored pencils or watercolors. Below the table are large boxes I got from Ikea that hold all kinds of craft supplies. I created this colored pencil holder for the majority of my Prisma pencils. I used large straws hot glued between two boards to create a stand so I could easily see all my colors and the names of each. I placed it on a base so it is easy to move closer to me while I am working. This light is one of my favorite items in my studio. I grew up on a family farm and I have fond memories of my grandpa carry this basket full of eggs back to the house each day. The next area is our sewing and multi purpose table. It pulls out from the wall if 4 people need to sit around for a ladies craft night. On both sides of my table I have Ikea Billy bookcases and inside each are Ikea boxes for storage. The small side shelving units are also Ikea and are sold as cd storage. However, I like putting buckets and glass jars in mine for open, easy access storage. Moving around the room you will find my rather large ironing board. 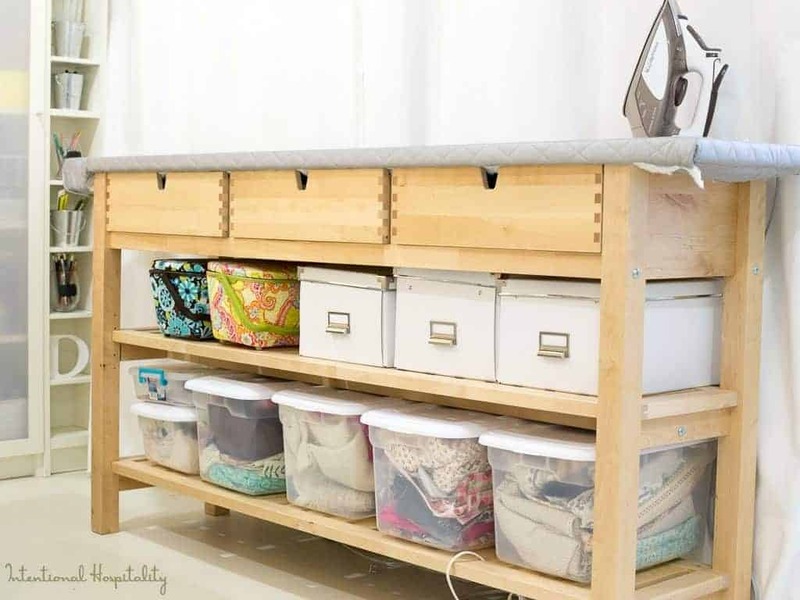 I wanted it close to our sewing area and large enough to iron table clothes on easily. This is normally sold as a dining room side bar from Ikea. I created my own Ikea hack by adding an extension to the end of the top. I then covered the whole top with thick padding and then covered it with ironing board fabric. Moving around the room I have a stack of buckets and a cheese cake pan, which might look out of place and strange but they do have a purpose. See that window in the door, placing those buckets in front of it and then place a large cutting board on top of all that creates a perfect backdrop for a food photo shot. So the bucks have a home in this corner. 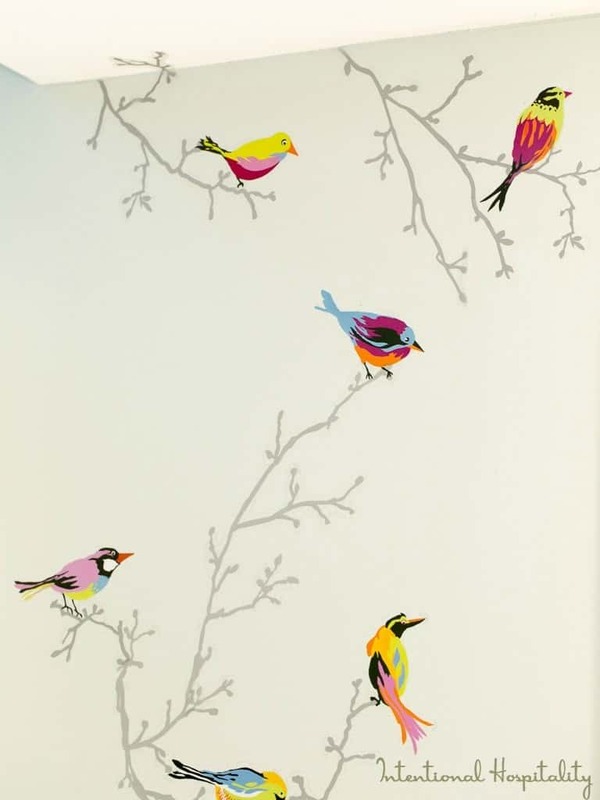 I added these Ikea bird stickers from floor to ceiling in this area also, just to give a punch of color and because I love birds. Next is my favorite area for photography. I have the large white bookshelf to hold a few of my favorite styling props and a shelf for my camera lenses and batteries. Below my backdrops and lights table is a small Ikea storage unit that I keep more food photo props in. The photography area extends over into more desktop space for whatever messy project I might have going. Above this area I use an Ikea shelf and instead of mounting it vertically I put it up horizontally. 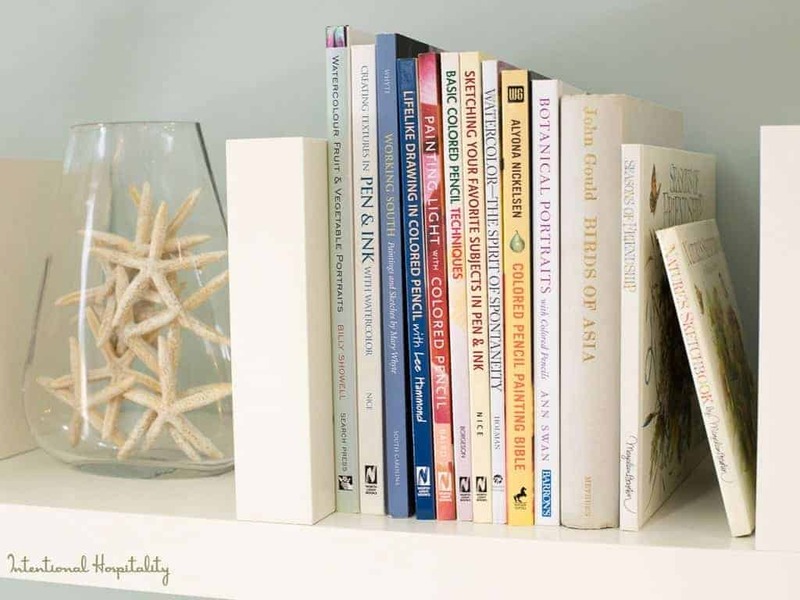 I keep a few of my favorite art books in the shelves and things that make me happy like this jar of starfish, because I love the beach. This vase and saucer is from my childhood growing up on the farm. 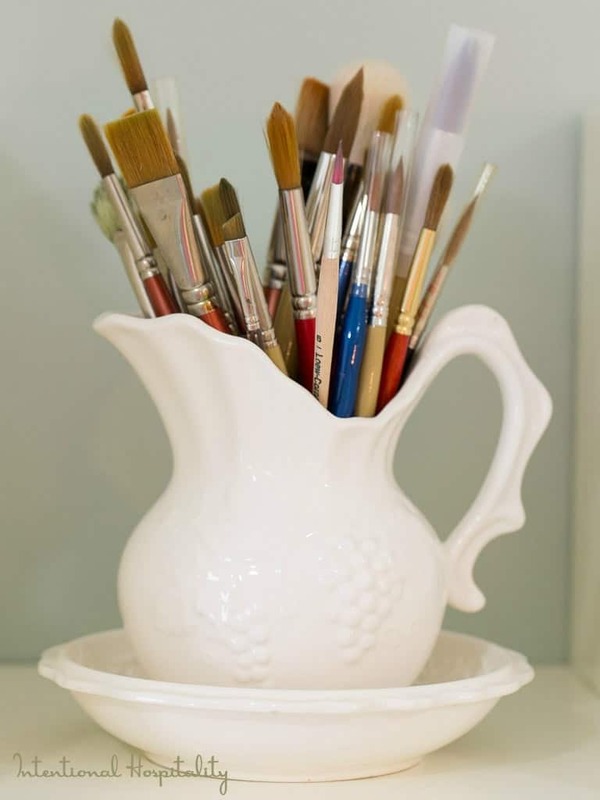 I keep my good watercolor brushes up on the shelf in this vase so they don’t get used for anything but watercolors. This is my favorite chair to sit in. 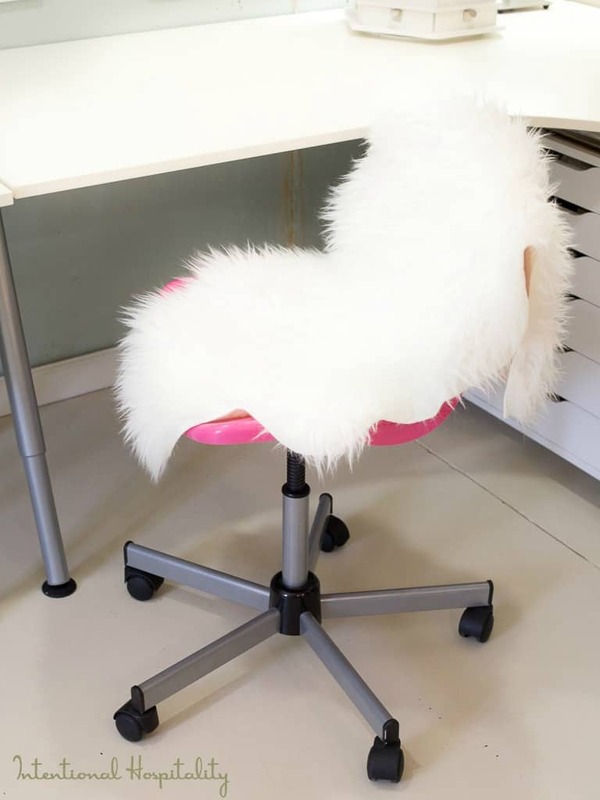 The faux fur is another Ikea find. I love how the splash of pink peeks through from the chair but not enough to lose the clean white theme in the room. My studio is about using things I love to organize and that have personal meaning to me. 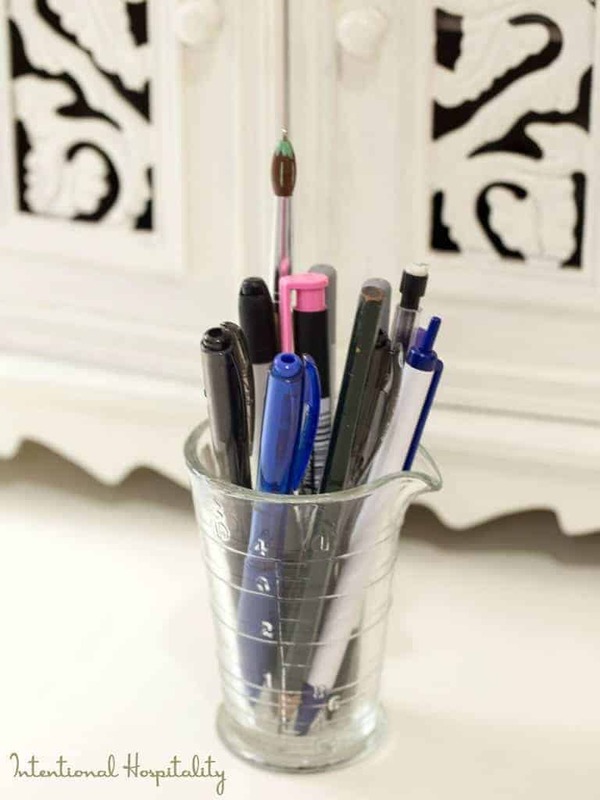 This pharmacy measuring jar belonged to my mom and I enjoy using it for a pen holder. I hope you enjoyed this tour as much as I have enjoyed sharing. So, now I’m headed to my studio to make a little mess and get creative. What will you do when you get more pencils? I really love that idea of having them out and visible! So simple! Well actually I do have more pencils! I have them in buckets in the shelves on the other wall. I have watercolor pencils and about 5o more refill colors of the regular color pencils. Some day I would like to make another one just like this one. 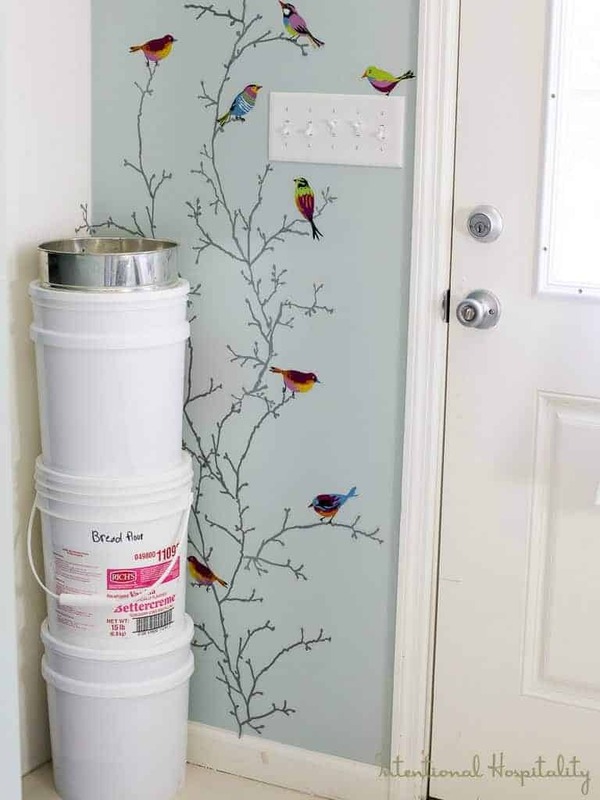 ( diy blog post idea!) It only cost about $3 to make this one! I LOVE your room, it is the perfect mix between form and function. 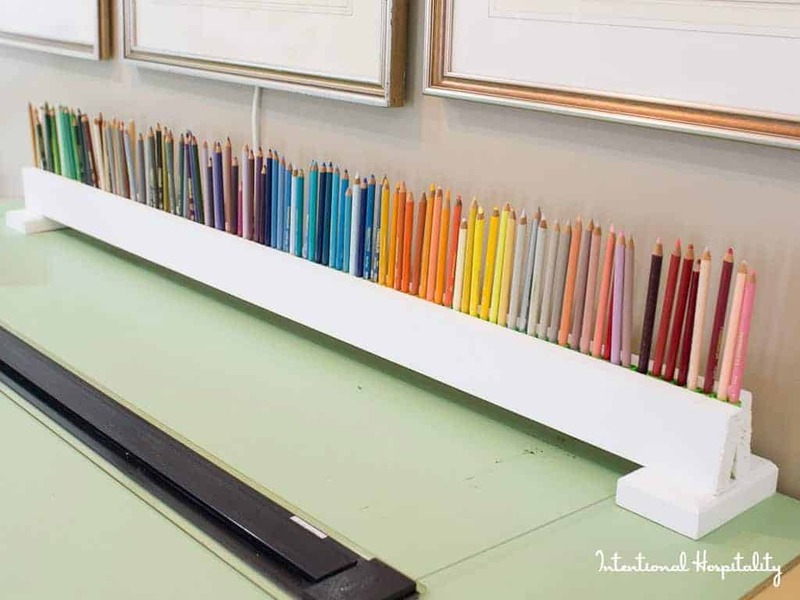 Great idea for holding your Prismacolor pencils BTW.. .
What a beautiful studio. 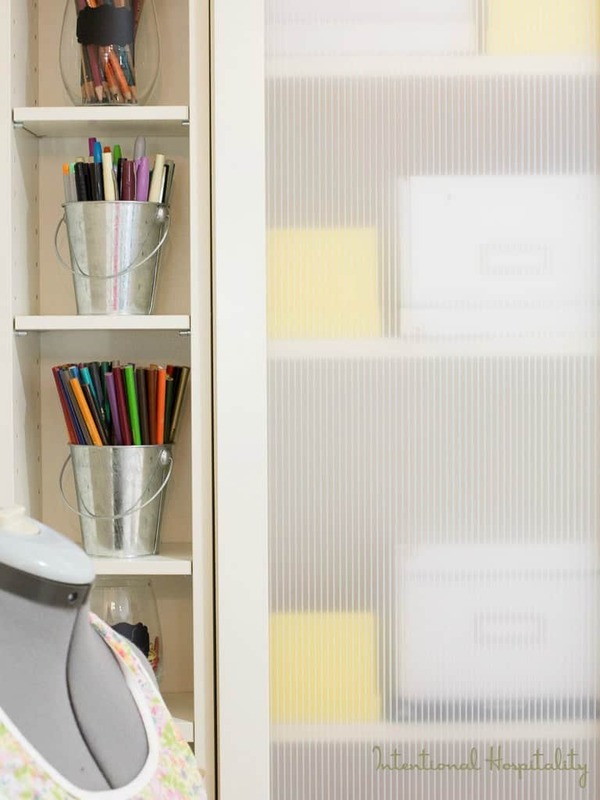 I love your drafting table, and that pencil holder is the ingenious. Thanks for the tour, and happy creating. Thanks Deborah, the drafting table was a gift from my sister at The Farmhouse Studio (https://www.facebook.com/JusteensFarmhouseStudio) She is an architect and was downsizing so I was given a very special gift. I love being able to stand and work on project at it also. Thanks, My studio is modern, but I’m leaning to a farmhouse style in other areas of my house. I grew up on a dairy farm in Indiana so I love to add my family pieces to help decorate. Hope you enjoy your visit around my site. Thank you Bobbie, glad you enjoyed it. 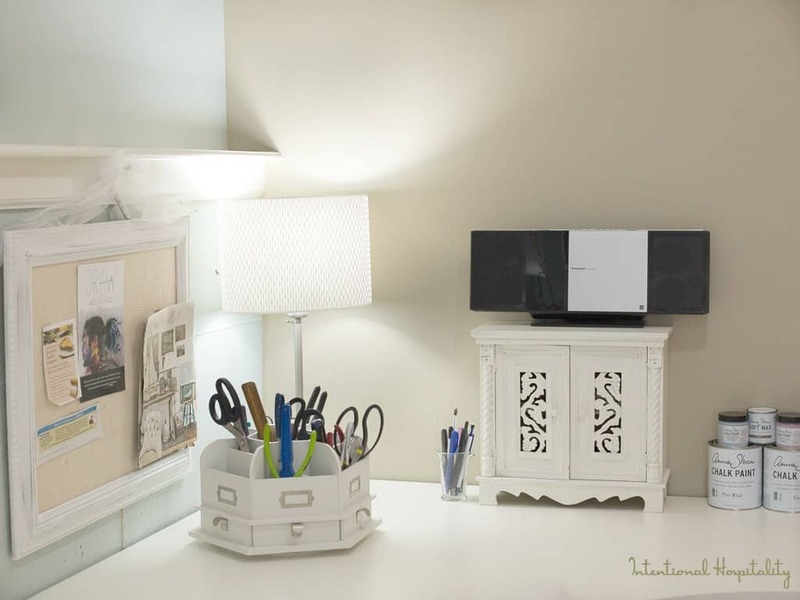 The uncluttered feel and cleanliness of your studio would be enough to inspire me! I like all the small pops of color such as the birds and colored pencils. They really stand out in just the right measure against the white backdrop. 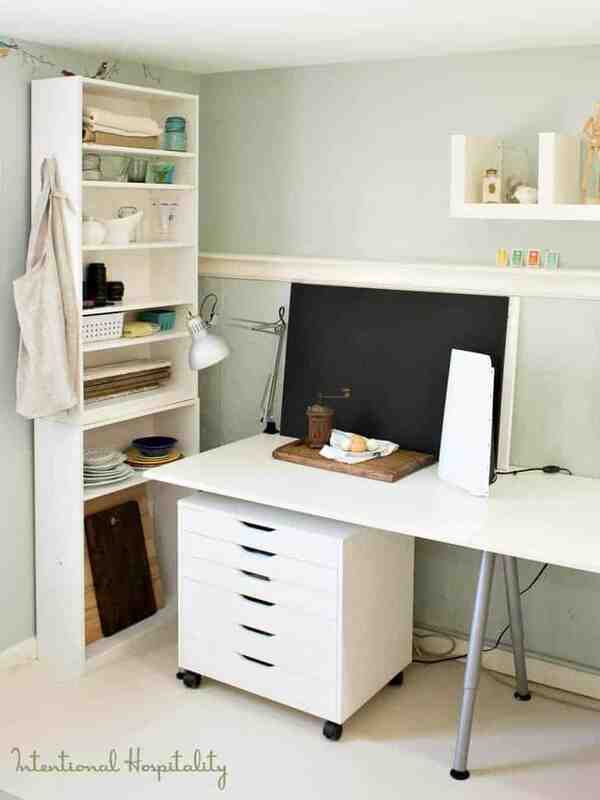 Your workspace is very modern looking and functional. 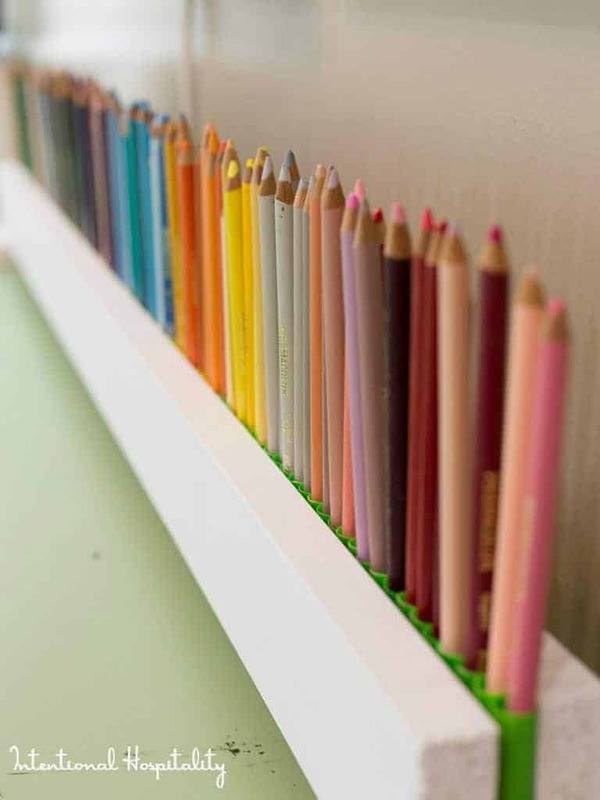 I like the pencil idea as I am constantly digging through a container to find the colour I want. It has been so much fun to glean an idea or two from each participant. Your studio is so beautiful! So neat too! 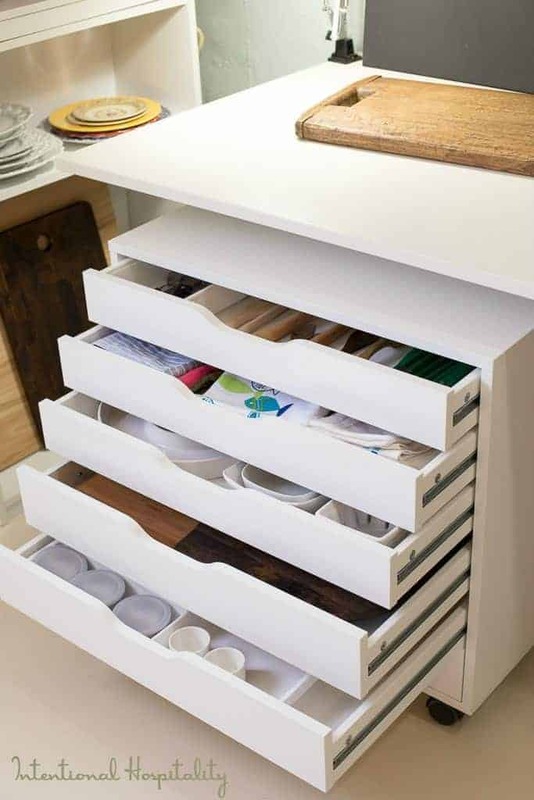 Love all of the storage you have and I’m sure it’s a wonderful place to create wonderfulness! Thank you for sharing it with us. Your room is so neat, clean and airy. Love the little touches of color that just pop! TFS! Love the lightness of this space!! I did not see any windows, is this a basement area?? 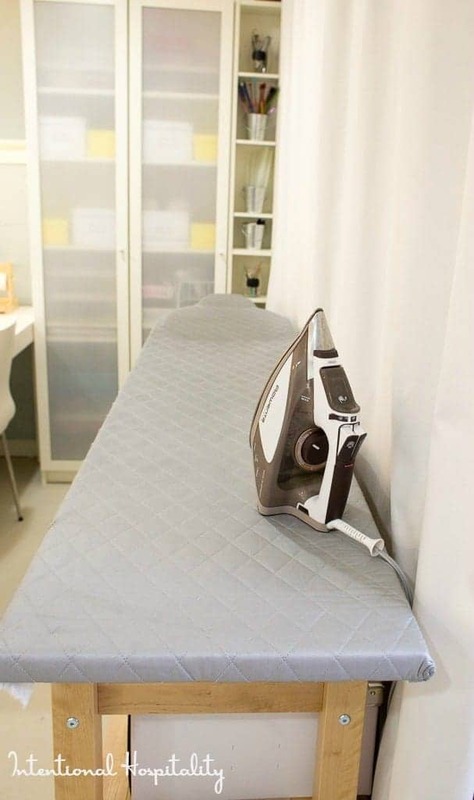 LOVE the ironing board table….ingenious and practical!! Thanks for the tour…. This is a walk out basement. I painted the cement floors white to make it feel bigger. There is one door with a window in it. Amazingly this window provides tons of light in the first half of the day for photography and a nice filtered light in the afternoon. I got the vintage coffee grinder last month at an open air market in Italy. Bargained in sign language since I didn’t know Italian, and after I saw more there I realized I got a really good one for a good price. They were probably amused by the silly American. I was in Italy taking a food styling photography class. I learned so much about lighting, props and how to properly use my camera settings. Hoping to find more classes in my area soon, I have a lot more to learn and loving it. Love your sleek modern bright studio! 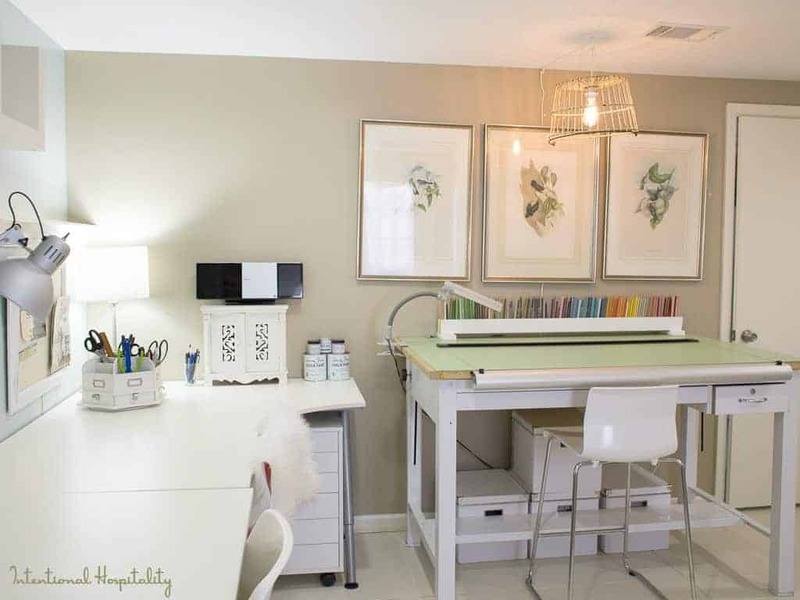 In love with that drafting table with all those colored pencils. Thank you for sharing. It’s obvious I’m running late to the party, but I am so glad to be here now. I couldn’t miss this opportunity to see your incredible studio. I might be organized, but your nearly white studio puts anything I could put together to shame. I was in AWE of your creative colored pencil holder. Very impressive outside the box thinking. People give me all kinds of weird things, and one time a friend gave me some clear acrylic cubes. I finally figured out they were ice cube props. I bet you have some, too. Thanks for sharing your lovely areas, including that great photography area I fell in love with. Thanks for stoping by for a visit. Your right people can pass on some of the strangest things but I love it when that thing becomes the perfect something for a project. Gina Marie, there is nothing about your space that I don’t absolutely love. It is so fresh, clean and organized . . . the total opposite of mine. I think that I was born with a bit of a messy gene, LOL. 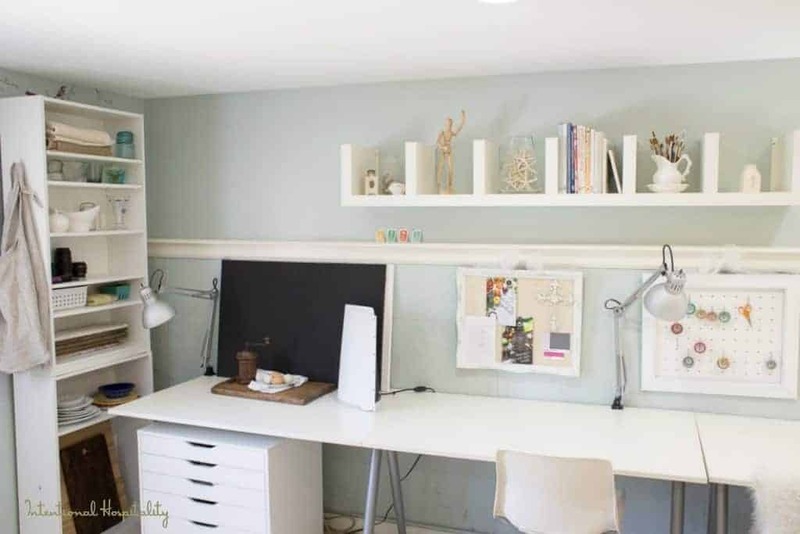 I love the ingenious way you built your pencil rack and your light fixture is beautiful. The story that you told about it is even more beautiful than the fixture. 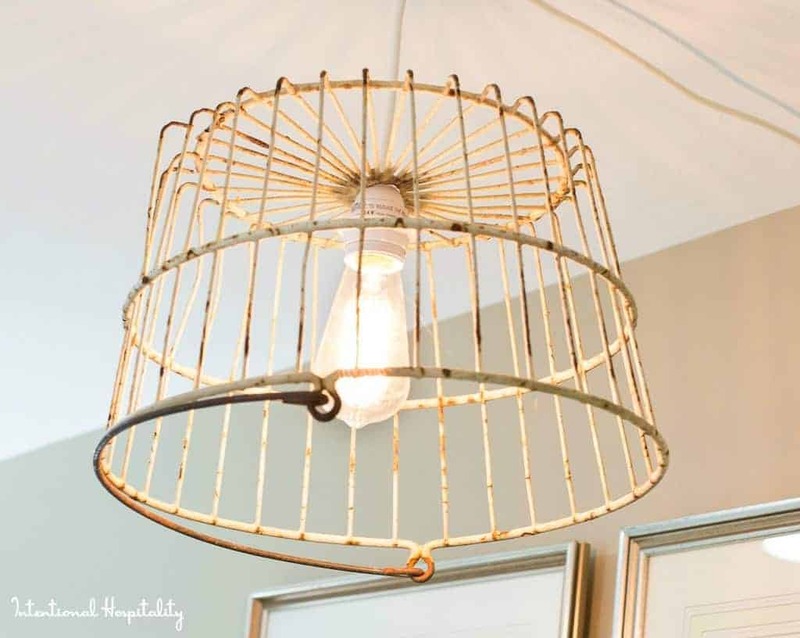 How sweet that you have grandpa’s old egg basket in your space. perfection! I would follow your blog, but I don’t see a place to do that, help! WOW, Gina, so fresh…I keep everything, I think “more is better”, I love to see my things everywhere around me, but your space…so clear, so organized…One day I want to be as organized as you are:)))Thanks so much for sharing! Thanks! With 6 kids I just kind of evolved into a neat freak so in hopes I could find things. ;) It seemed to help if everything had a place, even if that place was a box hidden behind a door. Hi Gina, what an amazing space you created for yourself! Love how bright and organized everything is! Thanks for sharing your amazing space! Love your space, the white on white is so calming and relaxing. And you have some really great areas to work on, love the ironing board idea and the pencil holder you made is brilliant (always looking for how to keep my pencils and pens available but also in a way that they look great and artistic). Great inspiration and very exciting tour! Hey Gina, Your studio is awesome and the way you did your job is wonderful…All are stylish design….. Thanks Austin. It’s my happy place for sure. After raising 6 kids, I enjoy a place to go and be creative in that is very clean and easy to organize.